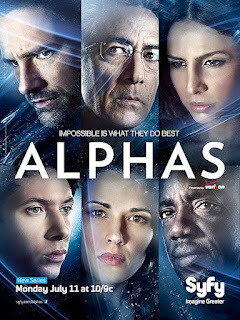 Alphas is a Sci-Fi (I won't call it Sy-Fy) Channel series whose first season is now available on DVD and Netflix streaming. Created by Zak Penn and Michael Karnow, the show follows a team of superhumans who work for the government solving crimes, tracking down other Alphas, and opposing a terrorist group called Red Flag. While the show does have promise, the writing breaks little new ground. If you’ve ever read X-Men, the setup and plot elements are familiar — just trade “Mutant" for "Alpha," then lose the costumes. There’s a team of good Alphas and a team of bad Alphas. Their ideological difference is X-Men versus The Brotherhood of Mutants. 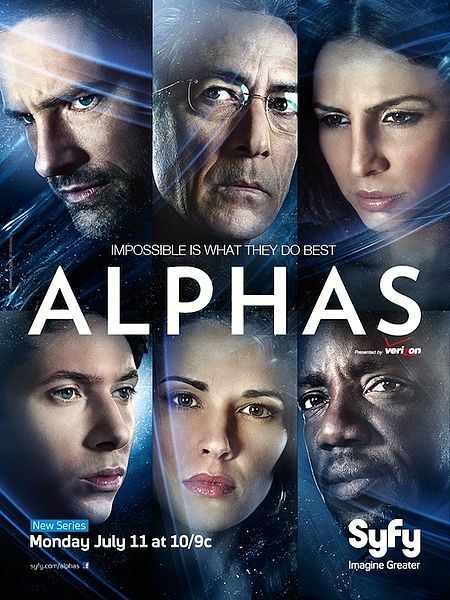 Rather than quickly setting their universe apart from Marvel's, Alphas mistakenly wastes a lot of episodes and focus on the team investigating crimes and tracking down the superhuman-of-the-week. Despite some cleverness, this is tedious syndication-fodder. The “crimes” follow the CSI/NCIS plot formula but with superpowers unearthing the clues instead of computers and lab equipment, and the superhuman-of-the-week apes the pattern of the generic X-Files stand-alone. If it wasn’t for strong characterizations from David Strathairn, Malik Yoba, and Ryan Cartwright, I wouldn’t have made it to the end of the season. The show doesn't find its identity until the last three episodes. "Blind Spot," "The Unusual Suspects," and "Original Sin" are well-paced, tense, exciting, and full of great character moments. They're what the entire season should have been. Now, if those episodes are the standard for its second season, Alphas has a long life ahead of it, and I'll tune in eagerly. But, if the writers follow the new television formula and produce a season of syndication-filler bookended with enough plot to maybe lure you back for another season, well...at least I didn't pay cable/dish prices to watch it.